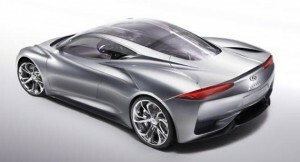 Geneva will be witnessing the debut of Infiniti’s concept car, what it calls Emerg-E, next month. There were speculations on the performance of the car, and renderings of its designs. But the images of the new concept hybrid has hit the internet. However, Infiniti wont be very upset about it, because the car does not reveal much except for its Ferrari 458 Italia like curves and sharpness of Lamborghini Gallardo. According to Infiniti, their Emerg-E is an electric powered sports car, with range-extended capability featuring a 1.2-litre engine. This mid-mounted engine car is claimed to have phenomenal performance for an electric car. Infiniti emphasizes the Emerg-E will be the first car from the brand to no only have a range-extended drivetrain but offer zero emissions capabilities. Further, the Emerg-E will also be the first to highlight Infiniti’s new styling direction. Electric cars are not known for their power, and this hybrid might just change the rules. But it does not matter what its got under the hood, when the external beauty is worth a billion and it’s a green car. Infiniti claims the Emerg-E to be their concept at Geneva, but it is not certain if it will go into production. We’ll be bringing more from this after it’s debut at Geneva next month.